You think you’re into Overwatch? Are you dedicated enough to role-play your favorite characters in another game, even if that means pretending to be a turret? While the world holds its breath for Overwatch’s impending launch, eNinja and friends decided to do something productive with the longing in their fingers and maybe also loins. Well, maybe not productive, but very entertaining. They decided to play Counter-Strike as Overwatch characters. Their five-person squad was comprised of Tracer, Bastion, Widowmaker, McCree, and Roadhog, with names and avatars to match. They role-played the entire thing. McCree ran around popping off shots with an R8 revolver, and everyone spammed their characters’ catch-phrases. The best part? The person who played Bastion just sat in one spot, rapidly scanning for targets and mowing down anybody who ended up in their field of vision. Yep, they pretended to be a turret. 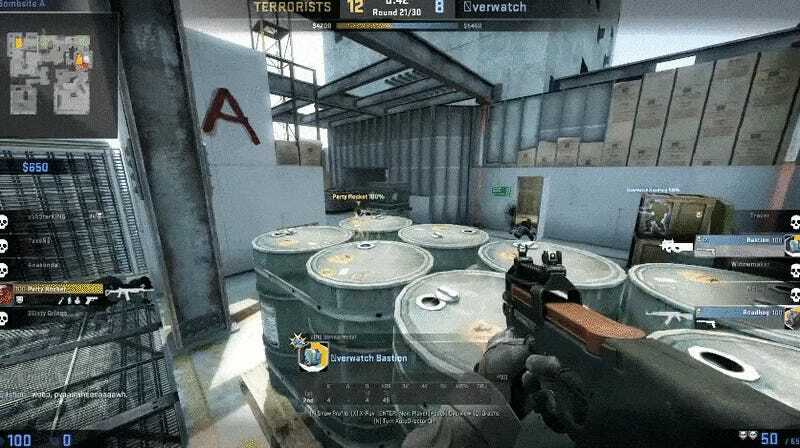 In Counter-Strike. The only problem with the video? It ends with an Overwatch-style Play Of The Game screen, but McCree takes it. A character who’s not Bastion getting POTG? Pffft, yeah right.